Anyone know what could cause the top to raise unevenly? The driver side will raise first then the passenger will follow. I replaced the cylinder and put new fluid in the system but it still wont raise evenly. Hmm! . That's a tricky situation. The only thing i can think of is maybe one of the lines is restricting the fluid. To test for this, you can label the lines, pull them off the cylinder and shoot fluid into a bucket. Please use caution and wear safety glasses. Test the bottom fluid lines first, with the other ones still on the cylinders. Then reconnect the bottom and test the upper lines. This way you can rule out the flow in the lines. You can put some transmission fluid in the bucket before you hit the top button, this way fluid doesn't hit the bottom of the bucket and splash everywhere. If your lines flow the same, then your frame is binding mechanically. Or the cylinder you installed also has blow-by. Is there a way to bleed air out of the system? Yes there is. Run the top up, then down, and open the reservoir fill plug. Tighten the plug, and repeat a couplr more times. There is a step by step procedure. Try Google search. And you are right, the O. P. should try bleeding the system. Then make sure all the fittings at the pump, and cylinders are tight. That is how air could have been introduced into the system: replacing the cylinder, or loose fittings. Did you ever figure thus out? No, I did replace a cylinder in it but it still wouldn’t raise evenly. The more the top raised and lowered,it evened up a little bit but you can still see the difference. I started having brake problems and then the weather turned cold. I’m getting ready to replace the rear window rubber sweeps that dry rot so when I do that I may look into the top more. I’ll let you know what I find. How uneven does it raise? I have one side about a 1/4 sec slower than the other side. Its off pretty bad. Looks like the driver side is doing all the work. 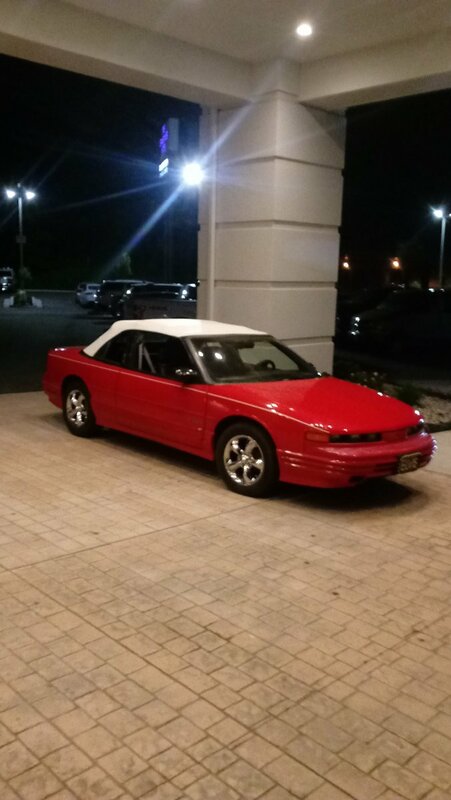 Before I bought the car it was stored inside for 12 years with the top down so it may just need a good adjusting and oiling up to get it moving again. Im replacing the sweeps on the corner windows soon so I'll look at it more then. Not sure if anyone has done this. What if you disconnected the cylinders from the top all together, then stood on the back seat and manually lifted the top from the center of the header bow. If the top frame was binding on the passengers side, you'd be able to feel it. If it feels even on both sides you know the issue is with the hydraulic system. I could try that. The hydraulic system also may need a good flush and fresh fluid.